Sam Mendes was a theater director before he became a film director, and until he directed “Revolutionary Road”, he had largely been able to avoid confusing the two. The script, written by Justin Haythe and based on a novel by Richard Yates, does not help Mendes’ cause, as it attempts to convey all sorts of ideas in convoluted and unrealistic dialogue. Novels can afford to be wordy and descriptive. Films, however, suffer when there is too little to see and too much to hear. Yet the script is not Mendes’ fault. His errors lie in the tempo of the dialogue, the stagey blocking of the actors and the lack of movement from the camera. There is no imagination, no artfulness, no attempt at cinematic storytelling in the use of the camera. Instead, it acts like a recorder, soaking up what Mendes apparently thinks is a set of performances, dialogue and costumes that is so good it can stand on its own. Yet still his hand can be seen, as he places the actors at noticeably measured distances from each other, often layered as though there is an upstage and downstage, and the cadences of the dialogue vibrate with drama in the least appealing way. Frank and April Wheeler (played by Leonardo DiCaprio and Kate Winslet) have a seemingly perfect marriage. Frank has a solid job, they own a nice home and have two children. The woman who sold them the house (played by Kathy Bates) is proud to have them there. Yet very quickly we find that all is not well underneath this facade of marital bliss. Frank casually has an affair with an office secretary, and it is not long before April’s manic depressive disorder rears its ugly head. We are not given quite enough background on either Frank or April. We see a few flashbacks that give us clues as to how they met and fell for each other, but we never get a clear picture of where they are coming from, or why they feel any of the things they feel. All we know is that neither of them have a strong grip on a mature reality; Frank is seemingly treading water, waiting for a miracle to come along and change his life for the better, and April hates her life so much that she creates fantasies, like moving to Paris or having a fling with the neighbor, which she then attempts to live out. If the intention of the film is to demonstrate how arrogant, mediocre and pathetic the Wheelers are, then it achieves its goal. But this is hardly worth seeing. Two drama queens who think they deserve better than what they have worked for is not interesting. We never see the true love which they are supposedly now losing; they are never admirable enough for us to then be disappointed when they fail; we only see glimpses of their children, so we do not even sympathize with them. Instead, what we take away from the film is that they were doomed from the beginning. April’s unhappiness is grounded in pipe dreams and clinical depression. Frank’s unhappiness is due to his laziness in finding satisfying work and being totally insensitive to his wife. Where is the real drama? There are plenty of “dramatic” tantrums and confessions and some trashing of furniture, but the decline of their relationship is predictable, uninteresting and regrettably unexplored. There are two notable “cinematic” moments that work quite well. The first is the morning after an enormous fight, in which both Frank and April had expressed their angry hatred of each other. Come breakfast, April is shockingly docile, friendly and hospitable. She smiles and does not raise her voice. She cooks him his eggs and inquires about work. At first, it is quite a frightening scene: is she so crazy that she has already forgotten the feelings of the night before? But no; a medium closeup shot gives her away. It is a subtle thing, a shift in her face, that betrays the sorrow looming behind the smiles. She is pretending for his sake, in an attempt to make it all (including him) go away. Because Mendes allows Winslet to simply speak and listen (rather than gesticulate or scream or pontificate) we get to see something brilliant, something meaningful. The other moment comes at the very end. Helen Givings, the woman who sold the Wheelers their house and who fawned over them and was so proud of them, is at home with her husband, who wears a hearing aid. The Wheelers no longer live in the neighborhood, and she has sold the house to a new young couple. “This new couple,” she says, “are the only suitable people I have ever found for that house.” The husband is surprised. “What about the Wheelers?” he asks. “Well”, she says, “They were too neurotic for me, and they let the place fall apart. There are mold spots on the…” and she continues on, listing all of the reasons that the Wheelers weren’t so wonderful after all. The husband grimaces, and he slowly turns down his hearing aid, until her voice fades, fades… and is silent. This moment is not only funny, but a fantastic example of what can be done so easily in the movies, but cannot be done in the theater. It is a closeup, giving us immediate knowledge of who is doing the hearing, and a manipulation of sound, one which allows us to refocus our attention on the actor’s face and his intention. It is a pity that so few of these moments exist in the film. For all of the absurd dialogue and staginess, Dicaprio, Winslet and Michael Shannon (as the insane John Givings) give excellent performances, perhaps even more impressive because of the low quality of material they have to work with. Roger Deakins does an excellent job with the cinematography, though his work is restricted almost completely to lighting rooms with little concern for camera movement. This entry was posted on May 19, 2010 by Ian Kay. 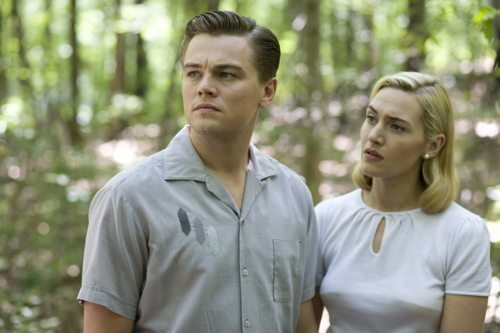 It was filed under Revolutionary Road (2008) and was tagged with dicaprio, mendes, revolutionary road, winslet.